Until the mid 19th century animals were transported live to slaughterhouses or larger butchers shops. There was no way of refrigerating the meat so it was sold quickly or smoked to make it last longer. 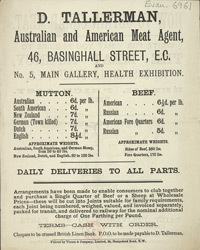 From the middle of the period refrigerators were available and technology had advanced so that meat could be transported around the country and even around the world.